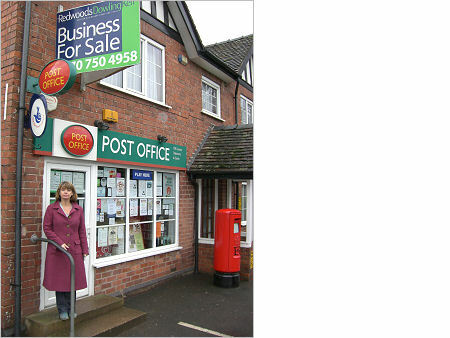 Harriett Baldwin, Conservative Parliamentary Candidate for West Worcestershire reactly strongly at confirmation that the Government is to push ahead with the closure of 2,500 Post Offices across the country, on top of the 4,000 already shut since 1999. In West Worcestershire, this could potentially mean the closure of 6 more Post Offices, from the current level of 33. "The Labour Government already holds the record for closing Post Offices faster than any other, they are now going to shut at least a further 2,500 branches over the next two years. This will be a hammer blow to community life. By the time of the next election, Tony Blair and Gordon Brown will have closed over one third of the entire Post Office network. "I fear rural communities across West Worcestershire will lose their only shop and vulnerable people will lose a service they depended upon. Labour Ministers have taken no account of the needs of the elderly, of disabled people or of the most disadvantaged - the very ones who will lose out most as this cuts programme rolls out. The Prime Minister may be changing, yet Gordon Brown is not going to offer the change that we need to save our local Post Offices." Conservatives have called for Sub-Post Offices to be given greater freedoms to offer a wider range of commercial products, are pushing for more Post Offices to be 'one stop shops' for local and central government services, and want to make the Post Office Card Account a more flexible financial tool with much greater functionality.